Whhhhhhhhatttttt?! These look amazing. Put caramel on anything and I'm pretty much a goner. YUM oh my gosh that looks good. 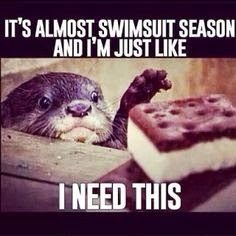 Basically this is how I've felt all summer because I can't resist treats that look as good as these muffins! LOL at the meme. These looks so yummy Rita. Ice cream definitely makes everything better. Aaahhh, these look amazing - especially with the ice cream! Bahahahaha! Oh man that last image, totally me! It's almost spring over here and I can't stop stuffing my face. Annnnd now I'll have to stuff it more with these little caramel cake thangs. Can. Not. Resist. Oh boy do these look good!! OMG I love anything with brown sugar and caramel. My mouth is watering like crazy. Ahhhh Rita!! WUAAA I love the last pic so much!!! !